Minitokyo »	Gunslinger Girl Scans » Gunslinger Girl: Over there.. This is something I scanned awhile ago for Anime Project Alliance. I decided to post it here for the wallers. 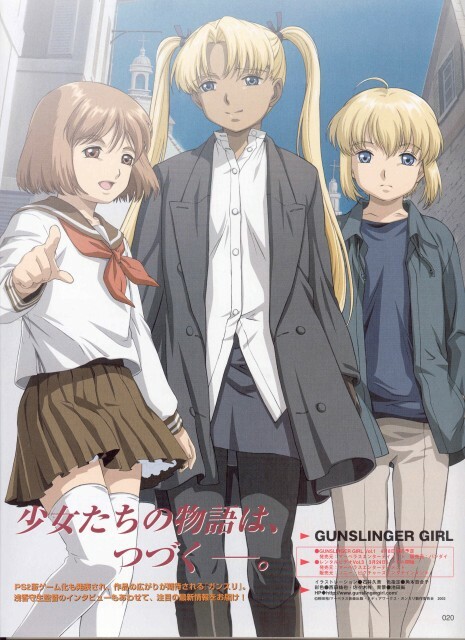 Browse Gunslinger Girl Gallery: Recent | Popular. ADV did a crappy job of translating the first manga in the series. What's sad is that they usually do a damn good job of translating animes. >.< Seriously, there are captions left entirely blank and some that go off the edge of the page. I hope they do better in the second book. At any rate, that's a cute scan. cool! a nice scan, don't see much GSG around...great work! Nice image, I like it. Yes, the picture of Henrietta looks odd but it's all good and anyways the scan is nice.